President Mark Burchill (“Pres Mark”) avoided the loud bell clang to open today’s meeting and our ears appreciated his easy tap. Pres Mark welcomed us to the place where fellowship and service come together. 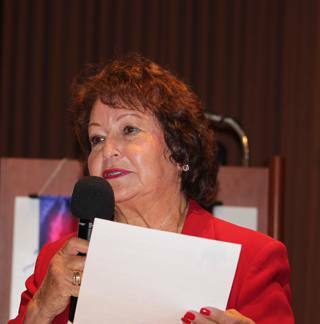 The Pledge of Allegiance was led by Ann Gospe. 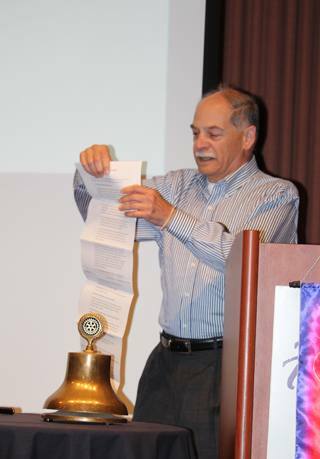 The Rotary Moment was by Dan Schell, who kept it clean and wasted no time in reciting, from memory, a long poem by Shel Silverstein entitled “Sarah Cynthia Silvia Stout Would Not Take the Garbage Out.” It was a poem of constant alliteration about an accumulation of garbage (and what was in it) that impacted the whole world. What a memory our Dan Schell has! Our official greeters today were Past President Debi Zaft and Peter Holewinski. According to Craig Meltzner, our single visiting Rotarian was our speaker, David G. Mark-Raymond from Sebastopol Sunrise. Our guests included: Emily Harrington, a guest of Cecil Humes. Like the weather, today was mostly sunny with only one cloud – Secretary Jack Abercrombie’s wife Pris is recovering from a foot condition. Jack was hoofing her down to the Bay Area for a check-up and was not available to comment. Get well, Pris! We want Jack back! With everyone’s attention fixated on the $202 raffle prize, Steve Marburger held up the bucket of tickets and the winning ticket was held by Blaine Goodwin. Blaine did not draw the correct marble, so he walked with the $10 consolation prize. At least he got his money back, which is better than the financial battering that befell the balance of the bruised bettors. The following club members have been nominated as board directors for the 2015-2017 term: Jack Atkin, Will Haymaker, Elizabeth Karbousky, Shannon McConnell. Julia Parranto is nominated for club president for 2017-2018. Club members will be voting to elect these nominees at next weeks’ Club Assembly. Other nominees will be taken from the floor at that time. The recent Club fund raising event, The Pillow Fights, resulted in a $15,500 net loss from operations. Our Club will be part of a Rotary Friendship Exchange with a district in New York City. Six more openings exist for Rotarians to travel to NYC for the week of April 7-14. If you are interested in taking part, see Rotarian Chris Parr of the West Santa Rosa Club. Our former member Dave Del Monte is the District Governor of the NYC District. The Bocce Ball tournament has been rescheduled to May 30, 2015. Pres Mark is hosting a wine tasting social at his house on December 8. Tasters will evaluate eight pinot noir or chardonnay wines from Sonoma County. Bring your best buds. Taste buds, that is. Thirteen November-born Rotarians were celebrated today and six received homemade pumpkin bread from Elizabeth Karbousky : Yale Abrams, Kathleen Archer, Laura Held, Jim Johnson, Mike Kallhoff, Fred Levin, Wally Lowry, Craig Meltzner, Diane Moresi, Julia Parranto, Bob Sorensen, Cathy Vicini, and Dan Wright. Julia Parranto reminds us that the bell ringing for the Salvation Army starts on December 12 at CVS drug store and Safeway market on 4th Street. The shifts are two hours. Sign up at next weeks’ meeting. Plan to bring a friend or family member along for the fun. Each kettle will have a team of two Rotarians. Julia also advised that the Children’s Christmas Party will be held on December 13 and volunteers are needed to shop for gifts for the kids. Nick Knickerbocker sincerely thanked the fifty or so members who purchased tickets and attended the Veterans Lunch last week. He thanked Paul Hamilton, Nona Lucas and Bob Sorensen for their help with event management. Ginny Cannon reminded us that our Rotary apparel is in and available at club meetings for pick-up. She also warned us of an impending Rotary apparel fashion show. If you purchased Rotary apparel, practice your “hand on hip” runway walk! Stand by for details. Jane Duggan alerted us to the annual Poinsettia plant sale in progress. Sign up at next weeks’ meeting to order your plants for $9.75 each. Our purchases will result in poinsettia plants being donated to the Vigil Light Senior Housing complex near the Flamingo. Jane is asking for volunteers to bring cookies for the December 3 visit to the complex. She will need a larger vehicle to provide plant pick-up from Home Depot. See her for that, you monster-truckers. Yes, it is better to confess to a crime than be caught by the Rotary police and money-boarded. 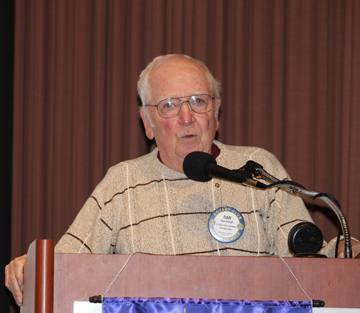 Ted Wilmsen while attending the Rotary Veteran’s Lunch last week discovered that his parked 20-year old Honda was stolen. It was recovered shortly after in San Jose, with minor damage. Ted was surprised his car was that valuable. He was so happy to have it back, he gave $200 to the John Brown Memorial Veterans Scholarship Fund of our local foundation. From one vet to another. Past President Steve Olson visited a Rogue River camp in Oregon and then journeyed to Ferndale. For those reality escapes, he needed to donate $100 to the Wes Jamison Memorial Agriculture Fund of our local foundation to assuage the guilt of having too much fun. He returned with a jar of root beer BBQ sauce for Pres Mark. Past President David Brown presented a trophy to the winning golf team from our club at the recent YMCA Golf Tournament. Rick Allen accepted the trophy on behalf of the team and he donated $25 to the club. After 32 years in Rotary, fairly senior club member Sam Saunders gave his updated craft talk, covering his Rotary service, career, education and family and personal life. The emphasis was on the Rotary motto of “Service Above Self” and the “4-Way Test.” The newest joy of his life is his new (and first) granddaughter of 7 months. He is walking on air these days. 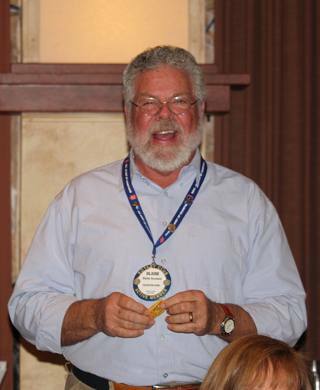 New member, Bart Eddy, was presented with his blue Rotary badge in exchange for his red badge and $10. Pres Mark felt so bad it took so long to recognize him that he paid a $10 fine. Our speaker was David Mark-Raymond, a Rotarian from the Sebastopol Sunrise club, on the topic of Charitable Giving to the Rotary International Foundation. He was introduced by President-Elect Doug Johnson. Mr. Mark-Raymond is the RI District 5130 (hey, that’s us!) Endowment Fund Chairman. Mr. Mark-Raymond started his presentation with a video on how RI Foundation sponsors projects in foreign countries to improve conditions such as promoting clean drinking water, sanitation, education, peacemaking and helping exploited workers. He advanced to a video on factory fabric weavers in India to show how RI Foundation helped establish a micro loan project to empower the workers to start their own businesses and help end their cycle of poverty and child labor. He provided a number of options for giving to the RI Foundation without actually writing a check. For example, he cited the opportunity to give once and save taxes in two ways by donating appreciated shares of stock. The donor will receive an income tax deduction for the full market value of the stock and also avoid the income tax that would have resulted from the sale of that stock (the tax on capital gains). RI Foundation will sell the stock and not pay income tax on the appreciation because it is a recognized tax-exempt charity. RI’s goal for giving in the 2014-2015 year is an annual average of $100 per Rotarian. Some may do more and some may do less than the average. If the average is achieved, the RI Foundation will collect about $120 million in donations from Rotarians. Other forms of giving may include the transfer by gift of rental real estate as a gift only, or in connection with receiving an annuity for the life of the donor (either with a fixed or variable rate of return). Also, making the RI Foundation a beneficiary on a life insurance policy or an IRA would also be an option. The gift of an interest in an IRA would save income tax since the tax-exempt organization would avoid income tax on its share of the ultimate distribution. One could also make RI Foundation as the named beneficiary on a “transfer on death (TOD)” type of account with a bank or brokerage. The RI Foundation also can set up a “donor advised fund” that would be an endowment to last for many years and the donor may provide guidance to RI Foundation on future recipients. At this juncture, Vickie Hardcastle, our Club’s RI Foundation representative stated that our Club will match Rotarian donations to RI Fdn (from $100 to a max of $300) through November 19. Pres Mark eloquently concluded with thanking all who served at today’s meeting, including: Matt Fannin and Doug Roberts for selling tickets and Darrell Horn for collecting the tickets. The meeting adjourned with a moment of silence for former member Earl Smith who recently passed away.